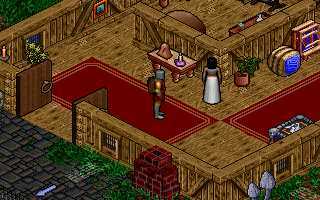 Ultima VIII: Pagan was the game that continues the story after Ultima VII: Serpent Isle. Basically the Guardian throws you into another world, and you have to find your way out. Computer   Graphics   Memory   Disk Space     O.S. * A Soundblaster, OR 100% compatible is required for the Speech Pack. Reviewed on: 486-66, 16MB, Soundblaster 16, MS-DOS 6.0. All these screen shots are of actual size, not thumb nailed, because, the game itself is only 320 x 200 resolution. Take a look at these! Here is a video talk about the game by Richard Garriott. Two toes up. It shows several signs of being slightly unfinished, which is a disappointment, but the overall package is still top notch. I played it for two weeks and thoroughly enjoyed myself, then went back and continued exploring. I have polled several people who completed the game, and they were all enthusiastic about it. I've been a long time fan of the Ultima series. Like most fans, I used to think that that atrocity Ultima Ascension was the game which destroyed the series. 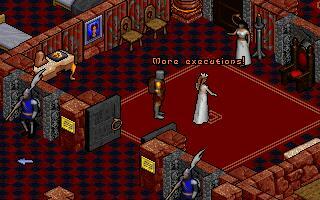 But upon playing Ultima 8: Pagan, I've changed my mind.